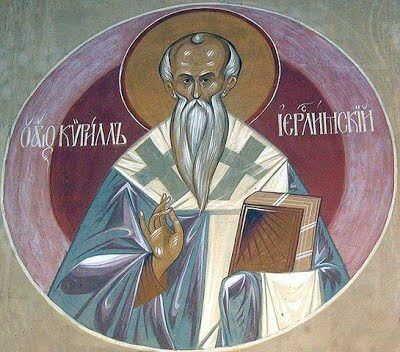 Saint Cyril of Jerusalem - My Catholic Life! It is the Christ-given obligation of every Catholic bishop, and the priests and deacons who share in his ministry, to teach, sanctify, and govern all people under their spiritual care. Regarding teaching, the letters of Saint Paul, as well as the writings of early Christian theologians, abundantly attest to the duty of the Apostles and their appointed successors to ensure that false doctrine never infects their flocks. The episcopal duty to teach was not a charism or gift of the Holy Spirit such as speaking in tongues, performing miracles, or healing the infirm. Teaching correct doctrine might be aided by the Holy Spirit, but it was first a mandate from the Lord Himself. To not teach, to teach incompletely, or to teach falsely, was for the shepherd to ignore, neglect, or scatter the sheep entrusted to his care and protection. Today’s saint, Cyril, the Bishop of Jerusalem in the late fourth century, was a model teacher of right doctrine. He did not just teach teachers what to teach. He did not deputize or delegate others to teach on his behalf. He was the local Father, and, concerned for Christian formation in the household of faith, he personally taught the faith. How do we know this? Two reasons: First, because a holy woman named Egeria went on pilgrimage to Jerusalem in the 380s. She documented her travels in a journal identifying the bishop, known to be Cyril, as the catechist in the domed mausoleum covering the tomb of Christ (part of today’s church of the Holy Sepulchre). Second, we know of Bishop Cyril’s talks because many of them were dutifully recorded and preserved, presumably because of their high caliber. The talks are rich, early testimony to the perennial, consistent doctrines of the Catholic Church. 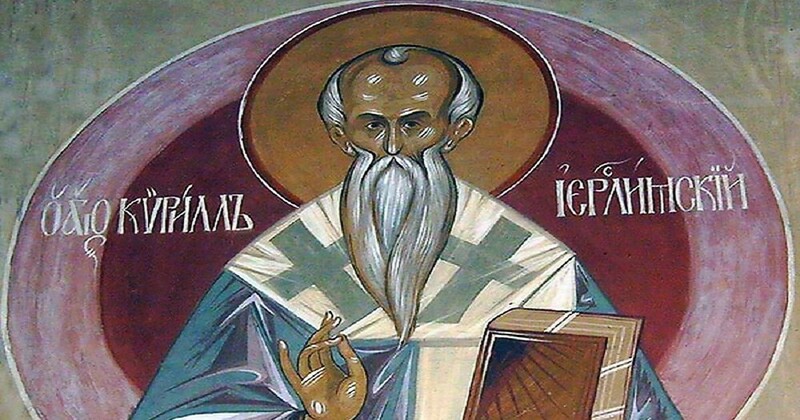 Egeria states that Cyril taught about Lent and Easter to catechumens and neophytes (the newly baptized) by going through the entire Bible and the Creed, article by article. He taught for three hours each day, every one of the forty days of Lent and during Easter week. In his letter to the Romans, Saint Paul wrote, “But how are they to call on one in whom they have not believed? And how are they to believe in one of whom they have never heard? And how are they to hear without someone to proclaim him?” (Romans 10:14). Bishop Cyril admirably fulfilled his apostolic duty to teach and to proclaim so that others would know the Lord. Among the profound teachings of Saint Cyril on the Mass, Baptism, and the Sacraments are his extended reflections on the nature of the Holy Eucharist. He is explicit: “Since He Himself has declared and said of the bread: This is My Body, who shall dare to doubt any more? And when He asserts and says: This is My Blood, who shall ever hesitate and say it is not His Blood?…Do not think it mere bread and wine, for it is the Body and Blood of Christ, according to the Lord’s declaration” (St. Cyril Catechetical Lecture XXII). Cyril notes that if Christ could change water into wine, why could He not change wine into His own Blood? Reading these words of Cyril, it is perplexing that any modern Christian could doubt the real presence of Christ in the Holy Eucharist. As Blessed Cardinal Newman wrote: “To be deep in history is to cease to be a Protestant”(An Essay on the Development of Christian Doctrine, Introduction, chpt. 5). Bishop Cyril was deeply involved in various consequential theological controversies of his day, was banished from Jerusalem, and participated in the First Council of Constantinople. He lived a long, complicated, and impactful life in the heart of the Church. He is in many ways a model to all bishops for his zealous yet tender care of souls, especially those preparing to be washed in the saving waters of baptism at Easter. Saint Cyril fortified the content of the Church’s teaching with his personal presence, and by extension, the presence of the Sacrament of Holy Orders in his very person. He is a bishop remote in time, yet near in doctrine. Far removed from us historically, he is still close at our side when we stand to recite the same Creed he recited at every Sunday Mass. Saint Cyril of Jerusalem, through your generous dedication to teaching the faith, come to the assistance of all catechists, ordained and lay, to be equally committed to teaching those under their care, in season and out of season, knowing that fidelity to the Lord and His Church is what counts the most.